Brown v. Board of Education of Topeka decision 1954 Supreme Court reverses Plessy by stating that separate schools are by nature unequal. Schools are ordered to desegregate "with all deliberate speed"
Montgomery bus boycott 1955-1957 Rosa Parks ignites 381-day bus boycott organized by Martin Luther King, Jr. 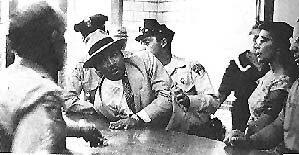 Lunch counter protests 1961 10 men sat at a "whites only" counter in Rock Hill, South Carolina in a protest against segregation. They were arrested and nine ("The Friendship Nine") were sentenced to 30 days labor on a chain gang. Medgar Evers murdered June 11, 1963 Head of Mississippi NAACP is shot outside his home on the same night that Pres. Kennedy addresses the nation on race, asking "Are we to say to the world...that this is a land of the free except for Negroes"
Feldmeth, Greg D. "U.S. History Resources"
Back to U.S. History Resources main page.